VANCOUVER, BC / ACCESSWIRE / March 27, 2019 / First Mining Gold Corp. (''First Mining'' or the ''Company'') is pleased to announce the results of an updated mineral resource estimate for its wholly-owned Goldlund gold project (''Goldlund'') in northwestern Ontario, Canada. This updated mineral resource estimate, which has an effective date of March 15, 2019, was prepared in accordance with National Instrument 43-101 Standards of Disclosure for Mineral Projects (''NI 43-101'') by WSP Canada Inc. (''WSP'') of Sudbury, Ontario. A technical report for this updated mineral resource estimate for Goldlund will be filed by the Company under the Company's SEDAR profile at www.sedar.com, and on the Company's website, within 45 days of the date of this news release. Zone 1 Indicated Resource gold (''Au'') ounces (''oz.'') increased by 37,950 oz. This increase in oz. corresponds to a decrease in tonnage of 625,600 tonnes from 5,508,000 tonnes at an average grade of 1.65 grams per tonne (''g/t'') Au to 4,882,400 tonnes at an average grade of 2.16 g/t Au. Zone 1 Inferred Resource Au oz. decreased by 219,800 oz. This represents an overall reduction in tonnage of 6,514,000 tonnes, with the number of tonnes decreasing from 17,802,000 tonnes at an average grade of 1.36 g/t Au to 11,288,000 tonnes at an average grade of 1.54 g/t Au. Zone 7 Indicated Resource Au oz. increased by 210,750 oz. This increase in oz. represents a corresponding increase in tonnage of 4,161,600 tonnes at an average grade of 1.58 g/t Au from zero tonnes previously. Zone 7 Inferred Resource Au oz. decreased by 446,560 oz. after adjusting for the proportion of Inferred Resource tonnes removed due to the upgrade of certain tonnes to the Indicated Resource category. This represents an overall reduction in tonnage of 16,019,000 tonnes, with the number of tonnes decreasing from 17,947,000 tonnes at an average grade of 1.28 g/t Au to 1,928,000 tonnes at an average grade of 1.29 g/t Au. In total, Indicated Resource Au oz. increased by 248,700 oz. This increase in oz. corresponds to an increase in tonnage of 3,595,900 tonnes from 9,324,100 tonnes at an average grade of 1.87 g/t Au to 12,860,000 tonnes at an average grade of 1.96 g/t Au. In total, Inferred Resource Au oz. decreased by 628,400 oz., after adjusting for the proportion of Inferred Resource tonnes removed due to the upgrade of certain tonnes and grade to the Indicated Resource category. This represents an overall reduction in tonnage of 22,533,000 tonnes from 40,895,000 tonnes at an average grade of 1.33 g/t Au to 18,362,000 tonnes at an average grade of 1.49 g/t Au. The numbers in the three columns of the above table under the heading “WSP 2019 Updated Resource Estimate” are from the updated mineral resource estimate on Goldlund that has an effective date of March 15, 2019, and that was prepared by WSP’s Todd McCracken, P.Geo., an independent “qualified person” within the meaning of NI 43-101. The numbers in the three columns of the above table under the heading “WSP 2017 Initial Resource Estimate” are from the mineral resource estimate on Goldlund that is set out in the technical report titled “Technical Report and Resource Estimation Update on the Goldlund Project” dated February 7, 2017, which was prepared by WSP’s Todd McCracken, P.Geo., in accordance with NI 43-101 and is available under First Mining’s SEDAR profile at www.sedar.com. A base case cut-off grade of 0.4 g/t Au was used for both the WSP 2019 Updated Resource Estimate and the WSP 2017 Initial Resource Estimate. For both the WSP 2019 Updated Resource Estimate and the WSP 2017 Initial Resource Estimate, resources are stated as contained within a conceptual pit shell using a metal price of US$1,350 per ounce of gold, mining costs of US$2.00 per tonne, processing plus G&A costs of US$15.40 per tonne, 93% recoveries and an average pit slope of 48 degrees. In this table, all mineral resource tonnage and contained metal numbers have been rounded to reflect the accuracy of the WSP 2019 Updated Resource Estimate and the WSP 2017 Initial Resource Estimate, and numbers may not add due to rounding. A Phase 1 drill program comprising a total of 100 holes (24,300 m of drilling) over the entire Zone 7 portion of the granodiorite dike, with 87 of the holes intersecting intervals of significant gold mineralization. Drill holes were spaced at 50 m along strike by 25 m across strike in order to address the nugget effect of very high gold values. The program confirmed that mineralization presents as free gold and calaverite in a quartz-ankerite pyrite stockwork. The stockwork is very consistent from the hangingwall to the footwall of the granodiorite, whereas the gold distribution occurs irregularly in the stockwork above inflections in the strike of the footwall of the dike. This drill program helped the Company's technical team to delineate additional Indicated resource ounces at Goldlund and to enhance our geological knowledge of the mineral deposit. A Phase 2 drill program comprising a total of 38 new holes (14,961 m of drilling), mostly all in Zone 1 of the resource body, with 33 of the holes intersecting intervals of significant gold mineralization. This drill program targeted existing Inferred resources in the vicinity of the historic underground workings. The constraining wireframes were adjusted by WSP to reflect the additional information presented in the Phase 2 drill hole data. The results of the Phase 1 and 2 drill programs have previously been announced by First Mining (for a comprehensive summary of the Phase 1 results please refer to the Company's news releases in 2017 dated April 25th, May 2nd, May24th, June 20th, July 10th, July27th and September 11th; for a comprehensivesummary of the Phase 2 results, please refer to the Company's newsreleases in 2018 dated February 5th, February8th, April 17th and May 15th). These 138 drill holes in Zones 7 and 1 that were drilled by First Mining during the Phase 1 and 2 drill programs were incorporated by WSP into the updated mineral resource estimate for Goldlund, nearly doubling the number of holes in Zone 7 that had been used by WSP for their initial 2017 resource estimate. During the course of the Zone 7 drilling, First Mining geologists observed that while the entire width of the granodiorite sill that hosts mineralization was susceptible to the development of stockwork, not all of the stockwork was susceptible to gold mineralization. Gold mineralization was shown to concentrate in the third of the sill toward the footwall. Consequently, the incorporation of this increased geologic understanding resulted in a reduction in tonnes in the "in-situ" model for Zone 7 which was further impacted by the Whittle pit constraint applied to develop the reportable resource. The Zone 1 domain is both larger in area and more extensively drilled than Zone 7, and it also exhibits some zoning of gold mineralization within the granodiorite sill. However, the extent of the spatial concentration of this mineralization is less pronounced than at Zone 7. After incorporating drill data from the Phase 2 drilling, WSP made adjustments to the wireframes of the mineralized zone in Zone 1 to reflect this new understanding of the spatial concentration of the mineralization, which resulted in fewer Inferred Resource tonnes in the pit-constrained resource at a higher average grade. In summary, the updated mineral resource estimate for Goldlund incorporated more than 40,000 m of incremental drilling, the majority of which was focused on increasing the confidence of the resource in Zone 7. While the increased data density and geological understanding of the deposit resulted in increased confidence of the resource, adding 3,535,900 tonnes into the Indicated Resource at an average grade of 1.96 g/t, it also resulted in a reduction in tonnes and ounces in the Inferred Resource category. The First Mining team believes that the increased understanding of the deposit will assist us in better targeting subsequent drill programs aimed at growing the resource at Goldlund, which remains open along strike to the northeast, to the southwest and at depth. In June 2018, First Mining commenced a regional exploration diamond drilling campaign at Goldlund designed to test the extension of the known mineralized trend approximately 10 kilometres ("km") northeast of the mineralized material at the current resource area. The primary objective of this program was to verify historical sampling and drilling results, outline new resources and demonstrate the potential of the northeastern section of the Goldlund land package. The exploration drilling was focused on the Miller and Eaglelund targets. Step-out drilling at the Miller prospect, located 10 km to the northeast of the main Goldlund deposit, yielded gold in a similar geological setting to the current resource area at Goldlund. Eight diamond drill holes at Miller (1,256 m of drilling) all exhibited the Goldlund-style mineralization of quartz-carbonate-pyrite-gold stockwork in a granodiorite dike. The Company has previously released the results for these eight drill holes at the Miller prospect (for a comprehensive summary of these drill results, please refer to the Company's news releases dated August 20, 2018 and September 20, 2018). Highlights of the Miller drill campaign included 108 m of2.43 g/t Au, and 31.0 m of 4.54 g/t Au in hole MI-18-002; 48.0 m of 1.17 g/t Au in hole MI-18-003; and 49 m of 2.58 g/t Au in MI-18-007, including 21.5 m at 5.54 g/t Au. The frequency ofoccurrence of visible gold ("VG") at Miller was much greater thanencountered in the Goldlund infill holes, with VG observed in sevenout of the total eight holes drilled in this program. Final results for all Miller holes are presented below in Table 2, and include all results of metallic screen fire assays which were rerun on selected samples, some of which still had pending assays at the time of First Mining's last news release on Goldlund in September 2018. Assaying for the Miller drill program was done by SGS at their laboratories in Red Lake, Cochrane and Lakefield, Ontario. Prepared samples were analyzed for gold by lead fusion fire assay with an atomic absorption spectrometry (''AAS'') finish. Multi-element analysis was also undertaken by two-acid aqua regia digestion with ICP-MS and AES finish. Reported widths are drilled core lengths; true widths are unknown at this time. Assay values are uncut. Au values in bold text contain results of metallic screen fire assay reruns. The Miller prospect is along strike and contains the same volcanic-intrusive stratigraphy as Goldlund, and thus opens up a 10 km long priority exploration corridor between the current resource area at Goldlund and the Miller prospect, as shown in Figure 1 below. See Figure 2 below for a cross-section of the Miller prospect. None of the drill results from the Miller prospect were incorporated into the updated mineral resource estimate for Goldlund. Step out and infill drilling at Miller is a priority work program in 2019 with a goal of establishing an initial resource. In addition to the drilling at the Miller prospect, First Mining also completed a further seven diamond drill holes at the Eaglelund prospect (638 m of drilling), and one diamond drill hole comprising 50 m of drilling at the Miles prospect (see Figure 3 and Table 4 for locations), and the results of this drilling are presented in Table 3 below. The holes at Eaglelund and Miles were targeted close to the locations of historical drill holes that were first drilled in the 1950s and 1980s, several of which reported gold mineralization (although locations and assay results for these holes cannot be verified). Some narrow gold intersections were encountered in this latest drilling, notably in the south west region of the Eaglelund target, with hole EL-18-002 intersecting 1.0 m at 2.22 g/t Au, and hole EL-18-003 intersecting 2.0 m at 6.42 g/t Au. No significant gold mineralization was encountered in the northeast area of drilling; however, mapping and drill logging show that the granodiorite sill, the host rock of gold mineralization, is faulted off and replaced by a sheared feldspar porphyry in this area. The faulted portion of the granodiorite sill has not been located during this drill campaign, hence additional drilling is required to delineate this and to better understand the control and distribution of the mineralization at the Eaglelund and Miles prospects. Assaying for the Eaglelund and Miles drill program was done by SGS at their laboratory in Lakefield, Ontario. Prepared samples were analyzed for gold by lead fusion fire assay with AAS finish. Multi-element analysis was also undertaken by two-acid aqua regia digestion with ICP-MS and AES finish. 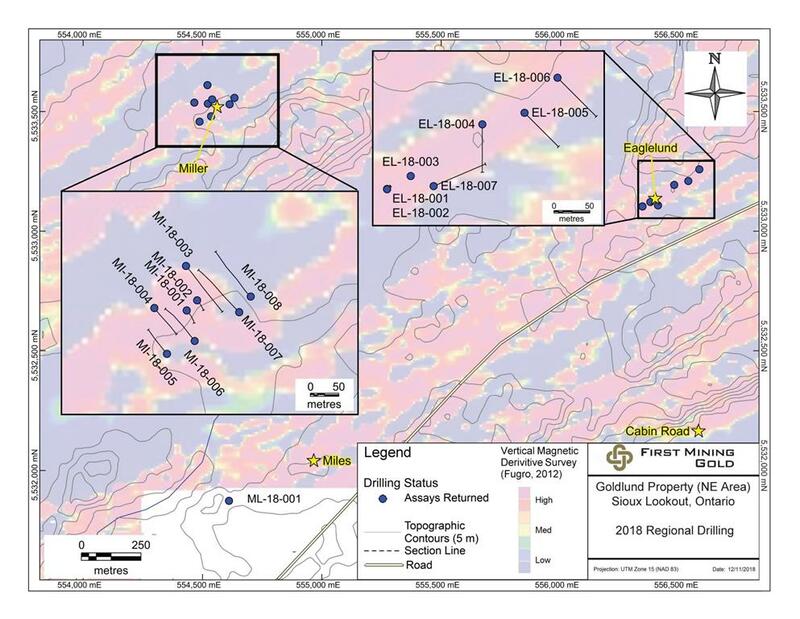 In addition to this regional exploration program, as part of the Phase 2 drill program, four holes in Zone 7 that were originally drilled during the Phase 1 program were extended deeper, for an additional 938 m of drilling, demonstrating that gold mineralization at Goldlund continues to considerable depths in Zone 7. Drill holes GL-17-10, GL-17-051, GL-17-106 and GL-17-108 were extended to depths of 629, 629, 455 and 500 m respectively. Drill results for these deep extensions are presented in Table 5 below (also previously reported in the Company's news release dated February 5, 2018). Assaying for the deep drilling program at Zone 7 was done by SGS at their laboratories in Burnaby, BC, and Red Lake, Ontario. Prepared samples were analyzed for gold by lead fusion fire assay with AAS finish. Multi-element analysis was also undertaken by two-acid aqua regia digestion with ICP-MS and AES finish. 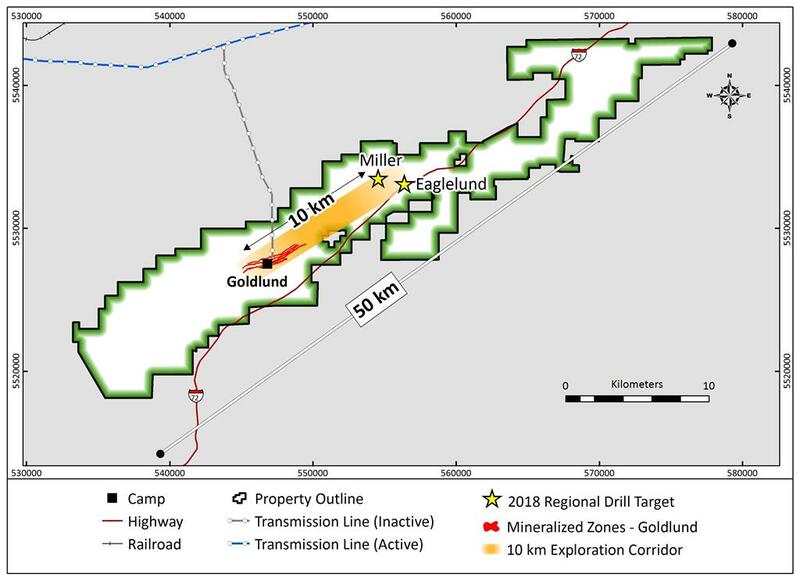 Mr. Wilton stated, "The highlight of the 2018 regional exploration program on the Goldlund property is the confirmation it provided to us that the geology and mineralization documented at the main Goldlund resource has also been demonstrated at the Miller prospect, which is ten kilometres northeast and along strike of the main Goldlund resource. As a result, First Mining has a priority exploration corridor located between these two areas. What should not be ignored, however, is the fact that the main Goldlund resource zone remains open along strike to the northeast, to the southwest, and at depth. 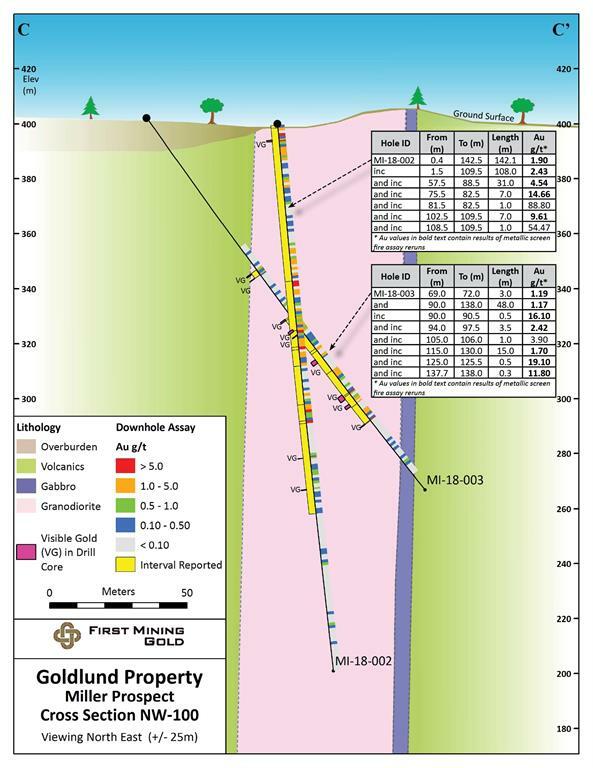 The deep drilling results in the Goldlund main zone, while they do not fall into a pit-optimized resource, demonstrate the continuity of the ore body and the presence of visible gold at depth and provide another important avenue for potential resource expansion in the future. The total contained interpreted strike length of the geological prospect on the Goldlund property is approximately fifty kilometres, and to date, First Mining has investigated less than 10% of this. We are very excited by the significant exploration upside presented by our Goldlund property." The QA/QC program for the Phase 1 and 2 drilling programs at Goldlund and the 2018 regional drilling program at the Miller, Eaglelund and Miles prospects consisted of the submission of duplicate samples and the insertion of certified reference materials and blanks at regular intervals. These were inserted at a rate of one standard for every 20 samples (5% of total) and one blank for every 30 samples (3% of total). The standards used in this program are sourced from CDN Resource Laboratories in Langley, BC. Blanks have been sourced locally from barren granitic material. Field duplicates from quartered core, as well as ‘coarse' or ‘pulp' duplicates taken from coarse reject material or pulverized splits, were also submitted at regular intervals with an insertion rate of 4% for field duplicates and 4% for coarse or pulp duplicates. For the Phase 1 and 2 drill programs, additional selected duplicates were submitted for screened metallic fire assay analysis, and for all of the drill programs (including the regional programs), duplicates were submitted to an umpire lab for check assaying. SGS also undertook their own internal coarse and pulp duplicate analysis to ensure proper sample preparation and equipment calibration. First Mining compiled all the data used in completing the updated mineral resource estimate for Goldlund from original source drill hole documents and from plan and section originals and copies. Goldlund has been tested by 2,195 drill holes, surface trenches and underground channel samples, plus development in the form of underground shafts, ramps, drifts, and an open pit. In addition to the drill hole database, a dataset containing underground wall sampling intervals was included. Wall sampling was conducted as continuous samples on both walls and at times at chest and back heights. The wall sampling data was converted into drill hole format to supplement the dataset. All resource estimations were conducted using SurpacTM version 6.8. Three-dimensional wireframe models of mineralization were developed for the seven zones based on: geology, alteration, a gold cut-off of greater than 0.2 g/t and a minimum 2 m horizontal width. Areas of drift development in mineralization were also created. Sectional interpretations were digitized in Datamine Studio software, and these interpretations were linked with tag strings and triangulated to build the three-dimensional solids by First Mining. WSP imported the Datamine solid files into SurpacTM for use, then updated certain files relating to Zones 1 and 7 where necessary. The mineralized zones are generally contiguous, however, due to several transverse faults throughout the Goldlund project, mineralization may often be terminated or shifted along these planes in one or more directions. The seven zones (Zones 1 through 8, no Zone 6), which are part of the mineral resource, were sampled by a total of 69,272 drill hole and trench intervals and 3,335 wall sample intervals. Individual block models were established in SurpacTM for all seven zones using one parent model as the origin. Drill hole spacing varies with the majority of the drilling tightly spaced from 30 m. A block size of 10 x 10 x 10 m was selected in order to accommodate the more closely spaced drilling and the narrow nature of the mineralization. Sub-celling of the block model was not used. The interpolations of the seven zones were completed using the following methods: nearest neighbour (NN), inverse distance squared (ID2) and ordinary kriging (OK). The estimationswere designed for four passes. In each pass, a minimum and maximumnumber of samples were required as well as a maximum number ofsamples from a borehole in order to satisfy the estimationcriteria. A pit shell was generated using the Lerchs-Grossman (LG) algorithm in Whittle. Table 6 below is a summary of the parameters used in the pit optimization process. WSP has concluded that the optimized pit shell suggests a resource using a 0.4 g/t Au cut-off and a US$1,350 gold price with a 5.8 strip ratio would be acceptable. The Goldlund database has gone through several validations including 10% of the total database extant prior to 2010. The error rate of the initial dataset was found to exceed 1% (most errors were insignificant and related to mistakes in transcription). The entire dataset was subsequently examined and corrected and a second review returned no errors. A total of 100% of the assay data received between 2011 and 2014 was checked against the digital assay certificates with no discrepancies found. The same is true of collar coordinates, survey data, and lithology intervals. For the 2017 round of validation, WSP validated 10% of the data set by comparing the assay data with the digital assay certificates, and no discrepancies were found. The same is true of collar coordinates, survey data, and lithology intervals. The drill hole data database underwent a final validation during loading into SurpacTM 6.8, which has a routine that checks for duplicate intervals, overlapping intervals, and intervals beyond the end of hole. No errors were identified. WSP confirmed the locations of 11 surface drill hole collars during the site visit in 2010, an additional 10 collars during the 2011 site visit, and a further 9 collars (with some duplication) during the 2013 site visit. These collar locations were collected using a Garmin GPSmap 60Cx hand-held GPS unit having an accepted resolution of ±5 metres. WSP confirmed the locations of 10 new surface drill hole collars during the site visit in 2014, and a further 20 collars during the 2017 site visit. These collar locations were collected using a Garmin GPSmap 62 hand-held GPS unit having an accepted resolution of ±5 metres. In 2010 and 2013, a total of thirty-five samples of mineralized drill core were collected and delivered by WSP to Actlabs and Accurassay in Thunder Bay for preparation and analysis. Actlabs and Accurassay are accredited to international quality standards through the International Organization for ISO/IEC 17025 (ISO/IEC 17025 includes ISO 9001 and ISO 9002 specifications) with CAN-P-1579 (Mineral Analysis). The check samples reproduced the grades in the Goldlund drill holes as accurately as would be expected in an Archean lode gold deposit. Pulps from a further thirty mineralized intervals in the 2013-2014 drill program were collected by WSP from the Accurassay facility in Thunder Bay and delivered by WSP to ALS Minerals in Sudbury, Ontario for analysis for gold using a 50 gram aliquot in a FA/AA finish. In addition, a QC test was performed on each sample to test the pulp fineness. WSP did not collect any check samples from its 2017 site visit to Goldlund. WSP has concluded that the sampling practices applied by First Mining at Goldlund meet current industry standards and that the sample database provided by First Mining and validated by WSP is suitable to support the updated resource estimation for Goldlund. Dr. Chris Osterman, P.Geo., Chief Operating Officer of First Mining, is a "qualified person" as defined by NI 43-101 and he has reviewed and accepts responsibility for the scientific and technical information contained in this news release. Mr. Todd McCracken, P.Geo, Manager with WSP Canada Inc., and the author of the technical report for the updated mineral resource estimate for Goldlund, is an independent "qualified person" within the meaning of NI 43-101. Neither Todd McCracken of WSP Canada Inc. nor any associates employed in the preparation of the technical report ("Consultants") have any beneficial interest in First Mining. These Consultants are not insiders, associates, or affiliates of First Mining. The results of the updated resource estimate for Goldlund are not dependent upon any prior agreements concerning the conclusions to be reached, nor are there any undisclosed understandings concerning any future business dealings between First Mining and the Consultants. The Consultants are paid a fee for their work in accordance with normal professional consulting practices. First Mining Gold Corp. is an emerging development company with a diversified portfolio of gold projects in North America. Having assembled a large resource base of 7.3 million ounces of gold in the Measured and Indicatedcategories and 3.6 million ounces of gold in the Inferred category in mining friendly jurisdictions of eastern Canada, First Mining is now focused on advancing its assets towards production. The Company currently holds a portfolio of 25 mineral assets in Canada, Mexico and the United States. For further information, please contact Frank Lagiglia, Investor Relations, at 604-639-8824, or visit our website at www.firstmininggold.com. ON BEHALF OFFIRST MINING GOLD CORP. Forward-looking statements in this news release relate to future events or future performance and reflect current estimates, predictions, expectations or beliefs regarding future events and include, but are not limited to, statements with respect to: (i) the filing by the Company of a technical report for this updated resource estimate for Goldlund under the Company's SEDAR profile at www.sedar.com, and on the Company's website, within 45 days of the date of this news release; (ii) the estimated amount and grade of mineral resources at Goldlund;(iii) the Company's belief that its technical team will benefit from a greater understanding of, and confidence in, the controls on mineralization at Goldlund, as a result of this updated mineral resource estimate for the project; and (iv) the potential for exploration upside at Goldlund, both along the 10 km long prospective exploration corridor between the current resource area and the Miller prospect, and further to the northeast of the Miller prospect along strike. All forward-looking statements are based on First Mining's or its consultants' current beliefs as well as various assumptions made by them and information currently available to them. The most significant assumptions are set forth above, but generally these assumptions include: (i) the presence of and continuity of metals at Goldlund at estimated grades; (ii) the capacities and durability of various machinery and equipment; and (iii) success in realizing proposed drilling programs. Although the Company's management considers these assumptions to be reasonable based on information currently available to it, they may prove to be incorrect. By their very nature, forward-looking statements involve inherent risks and uncertainties, both general and specific, and risks exist that estimates, forecasts, projections and other forward-looking statements will not be achieved or that assumptions do not reflect future experience. We caution readers not to place undue reliance on these forward-looking statements as a number of important factors could cause the actual outcomes to differ materially from the beliefs, plans, objectives, expectations, anticipations, estimates assumptions and intentions expressed in such forward-looking statements. These risk factors may be generally stated as the risk that the assumptions and estimates expressed above do not occur as forecast, but specifically include, without limitation: (i) risks relating to variations in the mineral content within the material identified as mineral resources from that predicted; (ii) general risks related to exploration drilling programs; (iii) developments in world metals markets; (iv) risks relating to fluctuations in the Canadian dollar relative to the US dollar; (v) management's discretion to refocus the Company's exploration efforts and/or alter the Company's short and long term business plans; and (vi) the additional risks described in First Mining's Annual Information Form for the year ended December 31, 2017 filed with the Canadian securities regulatory authorities under the Company's SEDAR profile at www.sedar.com, and in First Mining'sAnnual Report on Form 40-F filed with the SEC on EDGAR. First Mining cautions that the foregoing list of factors that may affect future results is not exhaustive. When relying on our forward-looking statements to make decisions with respect to First Mining, investors and others should carefully consider theforegoing factors and other uncertainties and potential events. First Mining does not undertake to update any forward-looking statement, whether written or oral, that may be made from time to time by the Company or on our behalf, except as required by law. This news release has been prepared in accordance with the requirements of the securities laws in effect in Canada, which differ from the requirements of U.S. securities laws. Unless otherwise indicated, all resource and reserve estimates included in this news release have been prepared in accordance with National Instrument 43-101 Standards of Disclosure for Mineral Projects ("NI 43-101") and the Canadian Institute of Mining, Metallurgy, and Petroleum 2014 Definition Standards on Mineral Resources and Mineral Reserves. NI 43-101 is a rule developed by the Canadian Securities Administrators which establishes standards for all public disclosure an issuer makes of scientific and technical information concerning mineral projects. Canadian standards,including NI 43-101, differ significantly from the requirements of the United States Securities and Exchange Commission ("SEC"), and mineral resource and reserve information contained herein may not be comparable to similar information disclosed by U.S. companies. In particular, and without limiting the generality of the foregoing, the term "resource" does not equate to the term "reserves". Under U.S. standards, mineralization may not be classified as a "reserve" unless the determination has been made that the mineralization could be economically and legally produced or extracted at the time the reserve determination is made. The SEC's disclosure standards normally do not permit the inclusion of information concerning "measured mineral resources", "indicated mineral resources" or "inferred mineral resources" or other descriptions of the amount of mineralization in mineral deposits that do not constitute "reserves" by U.S. standards in documents filed with the SEC. Investors are cautioned not to assume that any part or all of mineral deposits in these categories will ever be converted into reserves. U.S. investors should also understand that "inferred mineral resources" have a great amount of uncertainty as to their existence and great uncertainty as to their economic and legal feasibility. It cannot be assumed that all or any part of an "inferred mineral resource" will ever be upgraded to a higher category. Under Canadian rules, estimated "inferred mineral resources" may not form the basis of feasibility or pre-feasibility studies except in rare cases. Investors are cautioned not to assume that all or any part of an "inferred mineral resource" exists or is economically or legally mineable. Disclosure of "contained ounces" in a resource is permitted disclosure under Canadian regulations; however, the SEC normally only permits issuers to report mineralization that does not constitute "reserves" by SEC standards as in-place tonnage and grade without reference to unit measures. The requirements of NI 43-101 for identification of "reserves" are also not the same as those of the SEC, and reserves reported by the Company in compliance with NI 43-101 may not qualify as "reserves" under SEC standards. Accordingly, information concerning mineral deposits set forth herein may not be comparable with information made public by companies that report in accordance with U.S. standards.